There is an old Chinese adage that states, "Build the well before you are thirsty." It seems highly applicable to design and building. In the next few blog entries I'll be exploring the concept and some design ideas relating to aging in place. I guess that's partly because I'm ready and looking forward to staying put for a while. We're not young and we're not old either. What we are is getting ready to embark on our final homebuilding project (at least for a long long while) so it's on my mind. We want to build the right way for our needs, so that we can stay in our home for a long long time, incorporating needed and wished for spaces along with care and thought that will make the home comfortable for us potentially until we reach a great age. Here are some of the topics I'll explore, frequently using my own experiences as examples. I hope that despite including my own experience as a reference point you'll easily be able to substitute yourself and your own inclinations along the way. If you want more or find a particular area of interest, check back in to future entries for a more fully fleshed out exploration. In the meantime, just kick back and ask yourself, "If I go to the trouble and expense of designing my dream home, what features would I include to make it a home I can enjoy for many decades to come?" Can your home be designed so that it also "pays for itself?" For our next build, we want to incorporate some sort of structure in the design that will allow us to rent a fully separate part of our home out if we so choose. This will help with taxes, have the potential to generate income, and will provide space for visitors. Having an easy to care for unit that provides a little income potential will help us stay in our home, even if taxes continue to increase and we choose to retire someday, or if we weren't able to work any longer in our chosen field. Not only that, if we ever needed medical care from someone skilled, they could even have a place to stay (we live in a geographically complicated location). Designing for changes in physical capacities. Though not large, the 840 square foot Itacha Modern house we built offers a European style bathroom wet room with a curbless walk-in shower! It's now easy to design classy and sleek kitchens and baths that are also fully accessible (this is also sometimes referred to as barrier free design). Check out the slick bathroom styles you can choose from at http://trendingaccessibility.com - all barrier free if you choose to make them so. When we designed our last build, Ithaca Modern, which we finished earlier this year, we included a European style wet-room that has a curbless shower. Not only is it barrier free - it's easy to clean! Kitchens, when you are designing your own home, are well worth doing some thinking about, and when you start from scratch, you get to make the rules. It's worth considering how to include options for an unknown future along with the appliances you've always dreamt of. They can mesh, I'm convinced. Right sizing your house design. Health and mobility issues aside, what features should you include to make the house viable for your long term needs? This part of design is huge for aging in place without regrets! For us, it means spending enough time on the issue of right sizing. I'll use some of our concerns as examples. The bigger it is, the more maintenance costs involved both in time and money. Plus, we're minimalists by nature and don't want a huge house full of stuff. However, building too small could also land us on Rue Street (French 101 pun, sorry) - wishing we'd made enough space for things we really value and need. For example, we live in the usually wet and not too warm (but otherwise fairly wonderful) Pacific Northwest. For a couple of activity lovers, this leaves us valuing a space to work out indoors enough to include it in our design. Reaching a compromise with concerns. Again using ourselves as an example: Our building lot precludes building a one story house both dimensionally and in having a lovely view made even better with a second story. We don't anticipate losing our mobility - and take steps to maintain health. While we want to hedge our bets in designing for the long term, we can't hedge them all. We're okay with this, and with potentially needing to do some retrofitting down the road. I guess my point is, this isn't disaster planning - or at least, not strictly so. Nothing in thoughtful preparation has to preclude designing to your preconceived desires. Include what you want and at the same time spend a little time considering how it would feel to have to leave your home. Maybe there are some things you can include to make that a much less likely possibility, even if something rotten and unexpected happens to you. The nitty gritty aspects of ADA specifications. A ramp might be a less common need for aging in place but keeping entries wide and accessible without a lot of stairs could be useful. 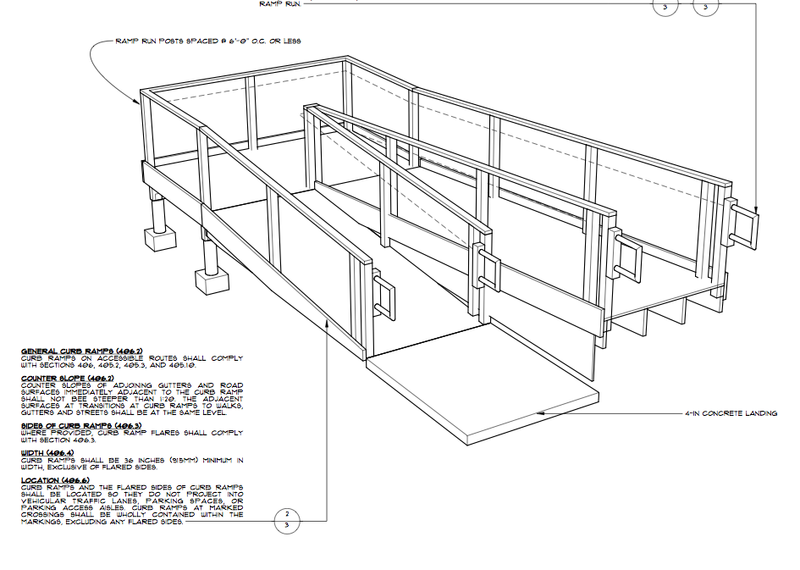 This is from an ADA approved plan we designed for some clients in our home town. It's a little daunting to read the requirements that commercial buildings need to adhere to to meet these standards - check it out here if you don't believe me. You don't have to meet every one of these standards for your own build, but it's useful to know things like minimum width for making a full turn in a wheelchair in a kitchen or bathroom, for example, or having some information about accessible hallway and door widths or window and counter top heights that assist in barrier free living. A little information can assist and even foster design tremendously. There is an old Chinese adage that states, "Build the well before you are thirsty." It seems highly applicable to design and building. Building a home that will accommodate you and your needs for the long term is great planning from a financial point of view at any age. You could just as easily employ this thinking when considering expanding your family as you could when downsizing at retirement age for example. This kind of thinking is one of the base layers of the Aging in Place approach to building. Do you plan on having kids? Is there a passion in your life that could likely become a home based business? As a quick thought exercise, Do you think at this point in time you could design a home that will last you all the way through your end? I'm not sure I could, but it's worth considering. I hope you'll stay tuned and enjoy some of my upcoming blog entries. If you have comments or suggestions, experiences or things especially on your priority list, I hope you'll share by sending me an email or leaving a comment below.